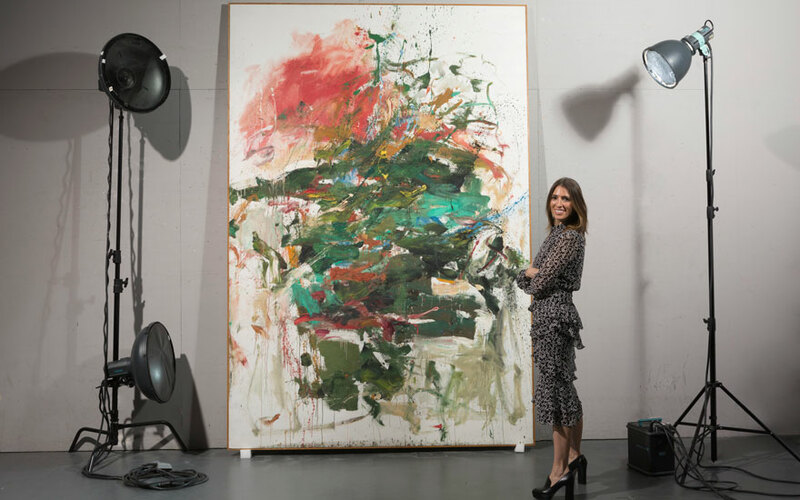 Joan Mitchell (1925-1992) was part of a young generation of Abstract Expressionist artists that emerged in the post-war era, and was celebrated for her raw, restless experimentations with colour. She exhibited with Jackson Pollock and Willem de Kooning and had regular solo shows at the Stable Gallery. In 1959 Mitchell moved to Paris to live with her lover, the charismatic Canadian artist Jean-Paul Riopelle. ‘She met Jean-Paul through their mutual friend Sam Francis,’ explains Flaum. ‘They were madly in love, but the relationship was incredibly volatile: they fought, made up, and fought again’. It didn’t help that Riopelle was the better-known artist in Europe, and the more exhibited of the two. It caused Mitchell a certain amount of bitterness. Shortly after the painting was completed it was acquired by Sam Francis, and it remained in his collection until he died in 1994. The American collector Barney Ebsworth then acquired it.